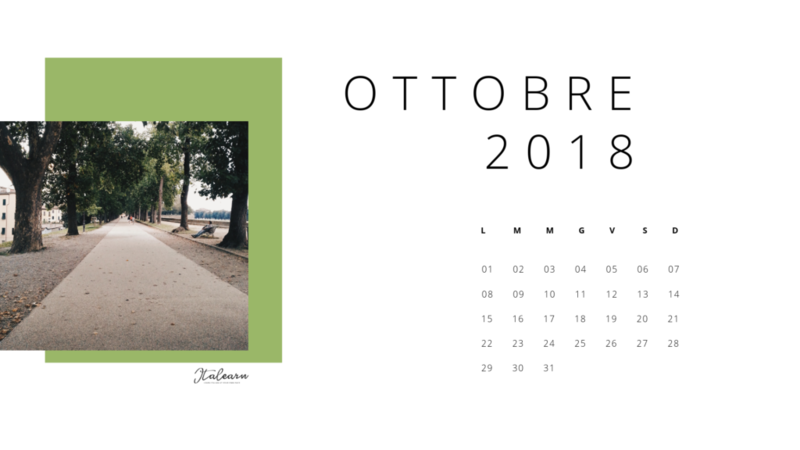 This page hosts a collection of free materials that I create to help you learning Italian. You can right-click them to save them to your device or share them on your social media. 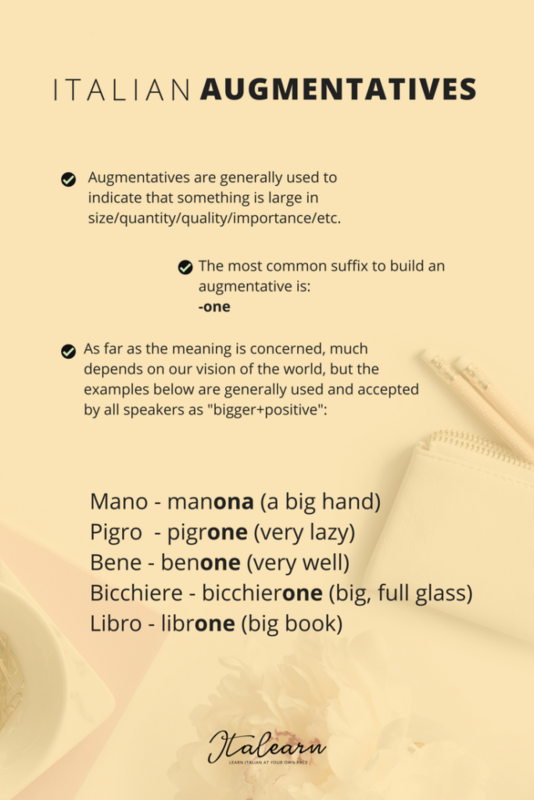 Italian grammar can be very complex, so I have selected some of the trickiest rules and explained them using short and easy to follow infographics. How do you spell it? It is not always easy to remember how to write a word. You can find the whole collection on Facebook, just click the button below. 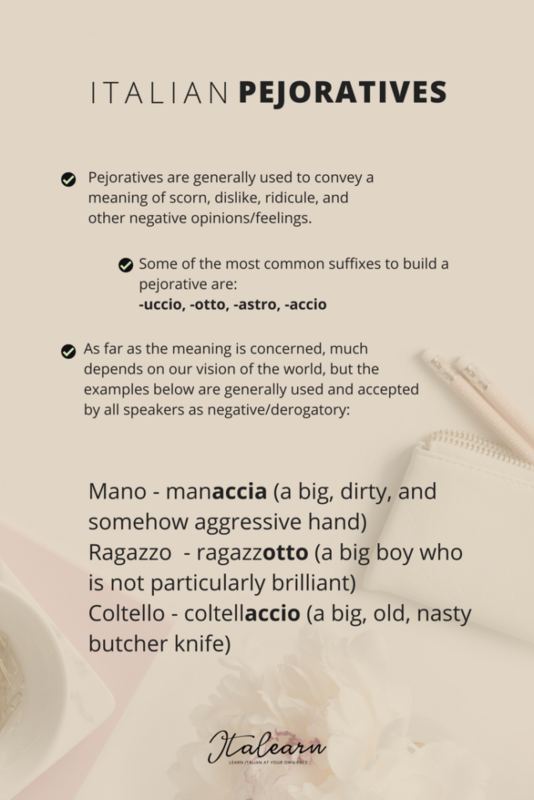 A collection of Italian words with meaning and examples. All words live on Instagram, follow @silvia_italearn to find them all and share your comments. Do you think you don't know how to survive in Italy? Click on the button below, you'll find 4 short videos with those simple words and phrases that will get you out of trouble! Oh yes, I will survive! 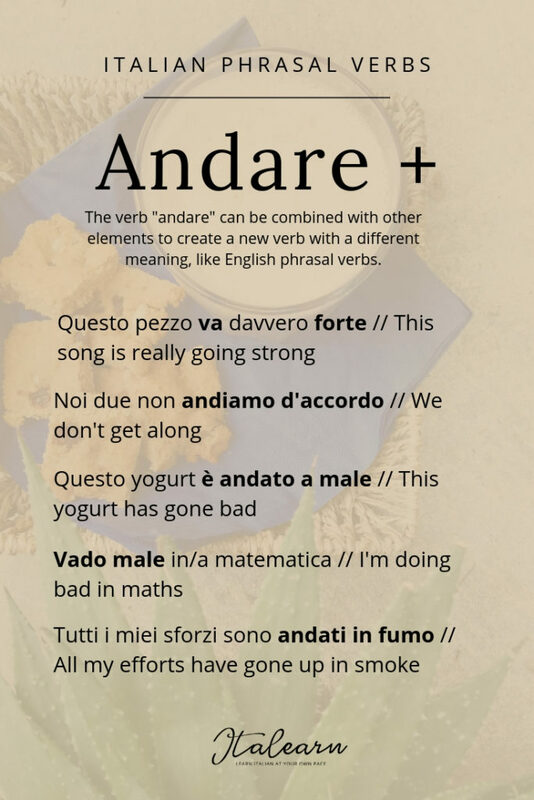 Andare is not just simply “to go”, if you add a preposition and another word, its meaning changes completely. In this infographic you can see a few examples, but there are many many more. 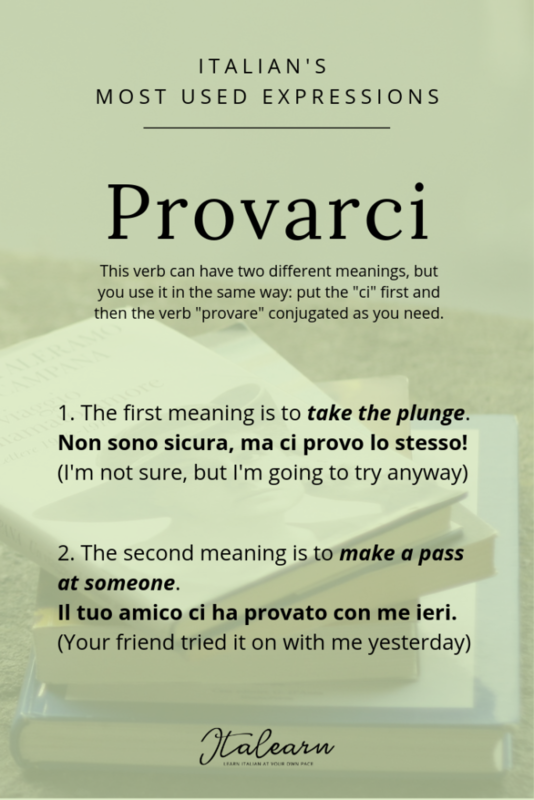 The verb provarci can have two different meanings that are not interchangeable. 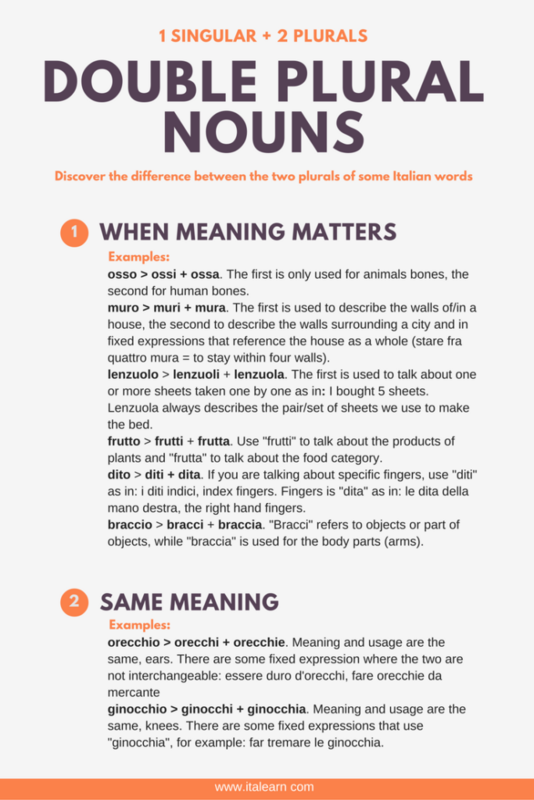 It is very common in Italian to have words with several meanings that are so different! As for the meaning, it can either be “take the plunge” or “make a pass at somenone”. 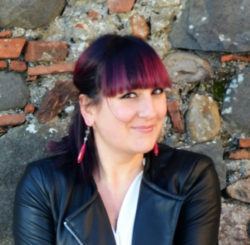 Learning Italian can be stylish, isn’t it what Italians are famous for? 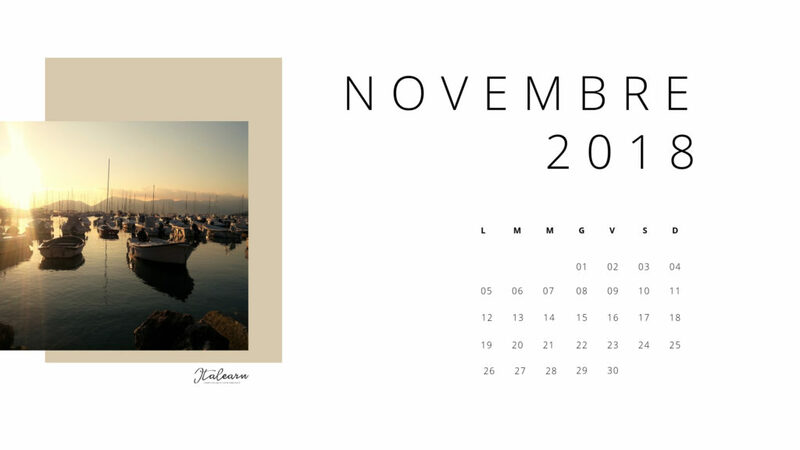 This template is free for you to save, download, print, etc. 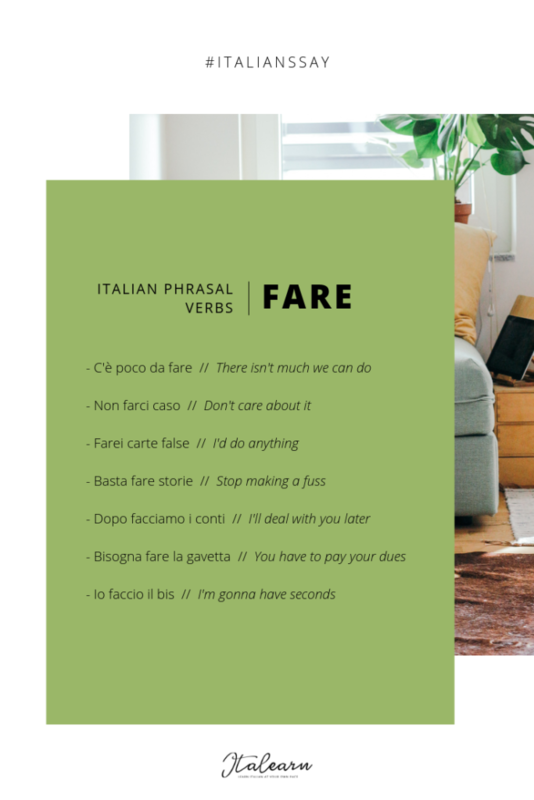 We do have phrasal verbs in Italian, they are usually made of a verb and another element that gives it meaning. The verb in itself is often “empty”, it means it needs a noun, or adjective, or adver, or verb to mean something. They can be tricky to find, sometimes you realize that you have to look at the context when that sentence really doesn’t make sense. 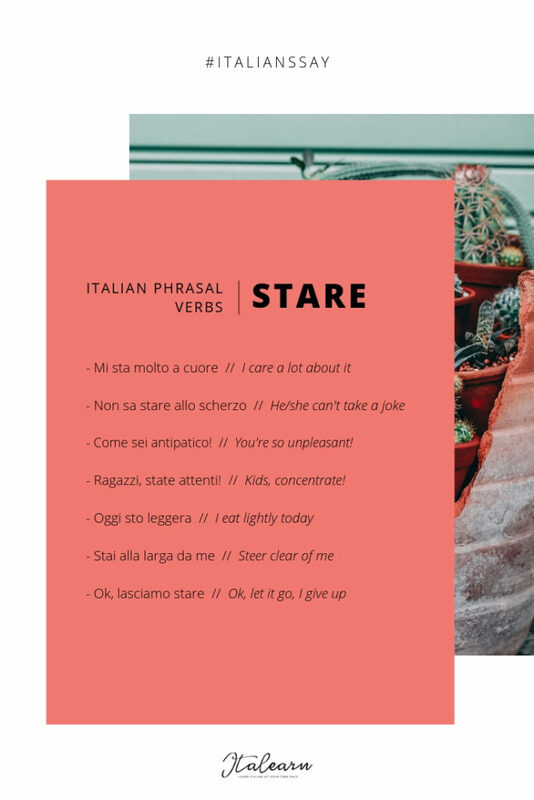 Here you can find a few examples of phrasal verbs with the verb stare – there are literally tens of them! 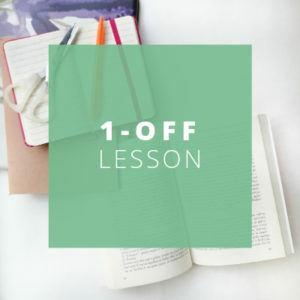 Here you can find a few examples of phrasal verbs with the verb fare – there are literally tens of them! 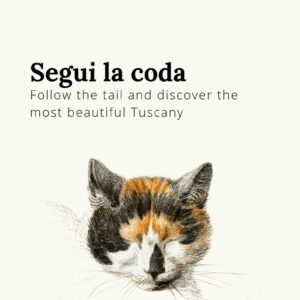 When Italians speak you seem to recognize some words, even though they sound a little different? One reason could be that we use a lot of alterations: we add a suffix at the end of a noun (or adjective, or even adverb) to add an extra meaning. Pejoratives are generally used to convey a meaning of scorn, dislike, ridicule, and other negative opinions/feelings. In Italian we say pretty things just by adding a suffix. 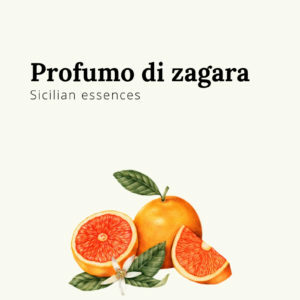 These altered words are called “vezzeggiativi”. In this case, more than for other alterations, it is our personal feelings that guide the word choice. There is usually a certain degree of affection involved – which sometimes leads to the creation of completely new words! When Italians speak you seem to recognize some words, even though they sound a little different? One reason could be that we use a lot of alterations: we add a suffix at the end of a noun (or adjective, or even adverb) to add an extra meaning. 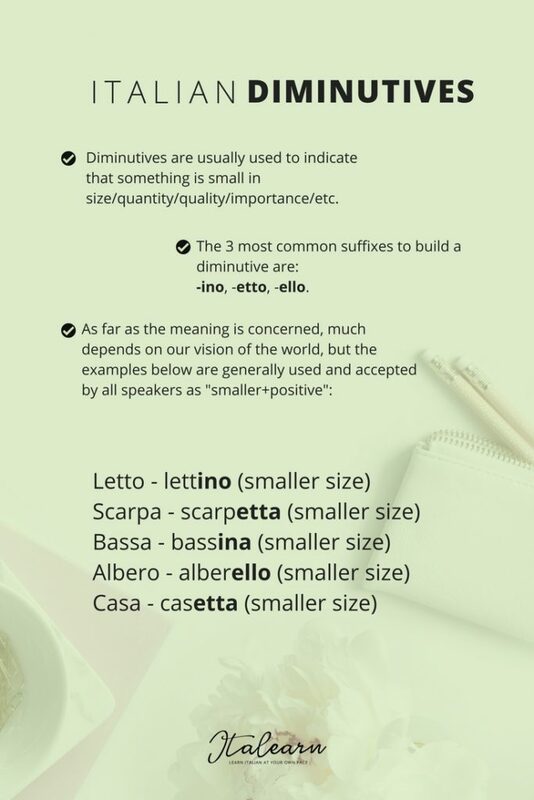 Diminutives are usually used to indicate that something is small in size/quantity/quality/importance/etc. 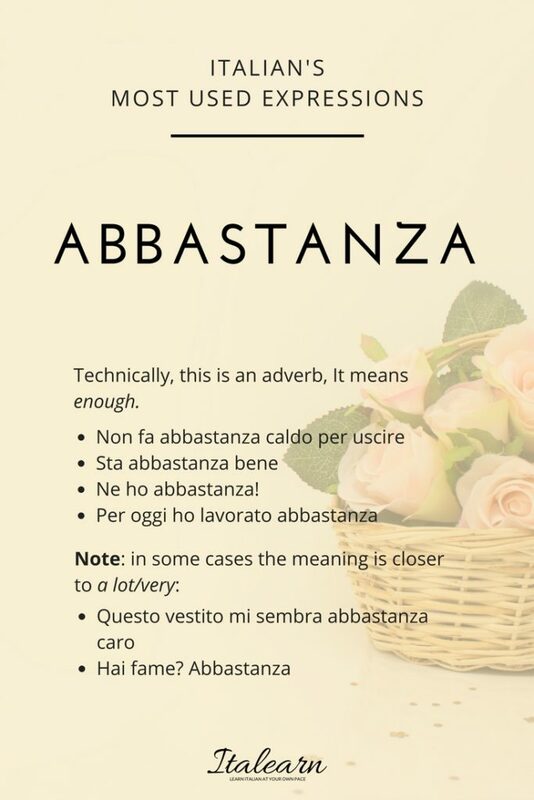 We use this adverb a lot in Italian, even as a single word answer! Are you hungry? A lot/very much! Definitely one of the most used Italian’s expressions. We use it a lot to express our disgust for something or someone. It is very informal, so make sure you don’t sound rude when you use this word/phrases. But if you are mad at someone for what they have done, you won’t be looking for soft and kind words, so go ahead with: mi fai schifo! (that’s very strong though). 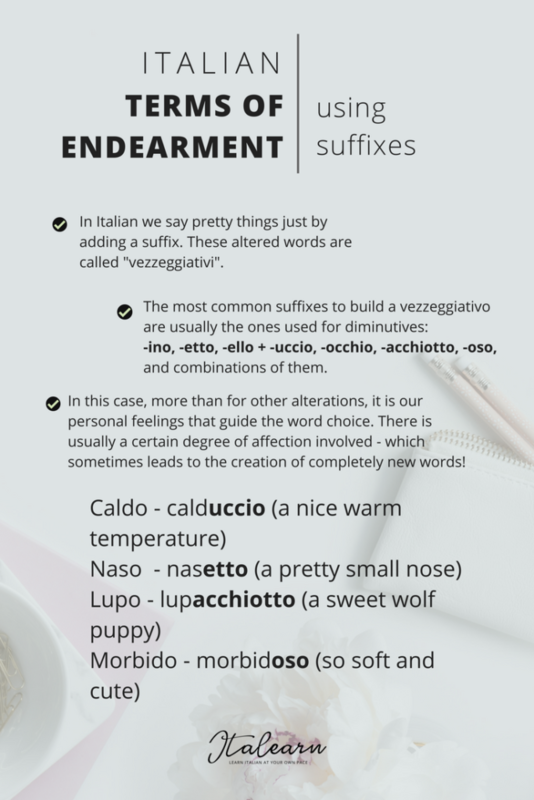 If you only know one tense in Italian, make it the present! Did you know that you can use it to talk about the past and the future too? 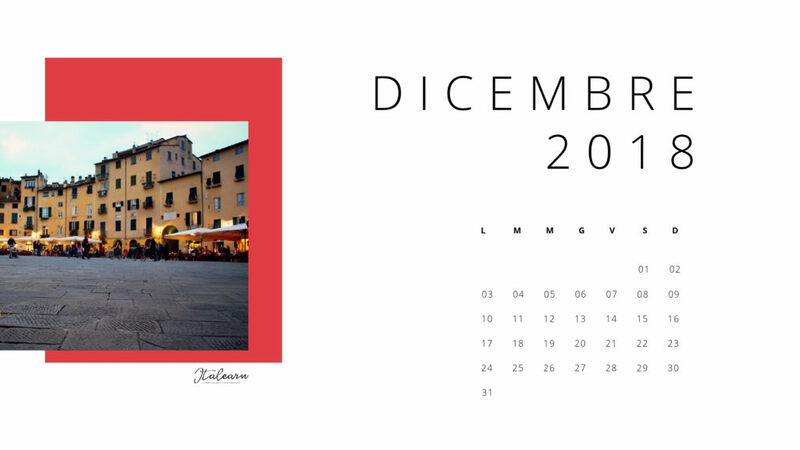 The general tendence in Italian is to simplify, so we often use the present to talk about past or future events. If you learn the right circumstances/occasion when it is ok to use the present, it will make your life much easier! 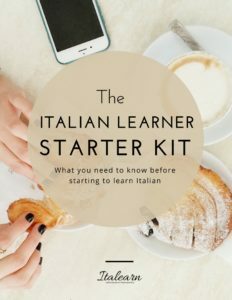 I have provided some examples, but the best way to learn is to listen to Italians, you’ll find out that this use of the present tense is very common. These are just a few examples, I have selected some of the more common words, that you may already know. It is important to remember to use the right article, so you never get misunderstood! 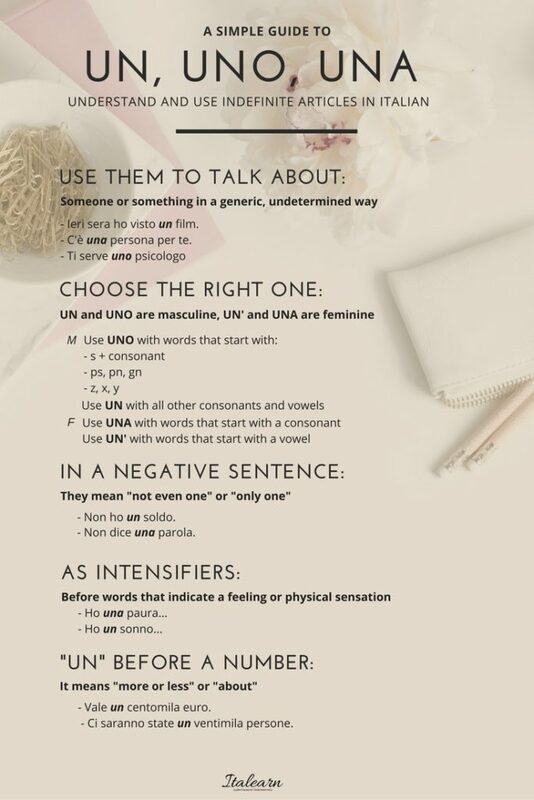 The general rule would have nouns ending in -o to be masculine and nouns ending in -a to be feminine. It is not always true, there are exceptions. Here you can find some very common words that are tricky. I have added the article to help you understand their gender better. The gender of these words is purely grammatical, it has been established with use. But what do you do when you need a noun to describe a person, and you know that noun is masculine but the person is a woman? Just use the right article and it will tell the gender of the person you are talking about. 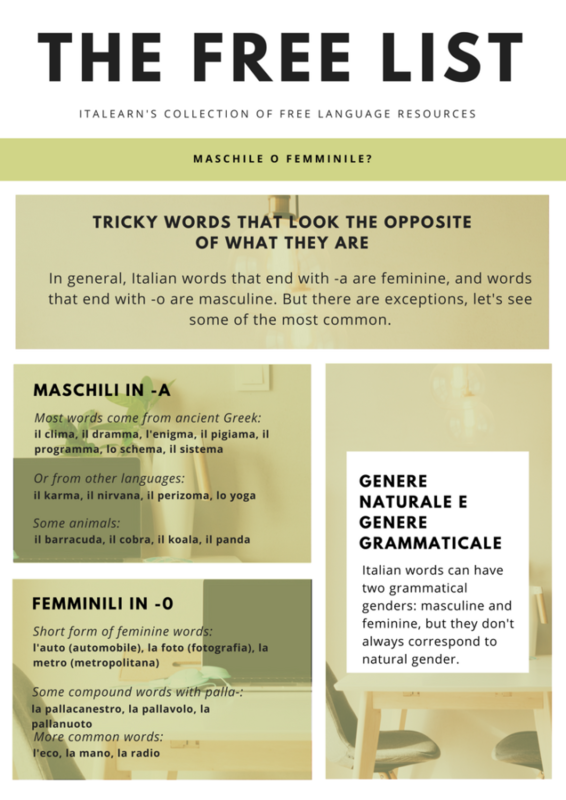 There are a few words in Italian with a double plural, both feminine and masculine. In most cases the two plurals correspond to two slightly different meanings. I have listed just some of the more common words in this free infographic. Please note that the first plural for each word is the masculine and the second is the feminine. It takes a bit of practice to get them right, even Italians sometimes mix them up! 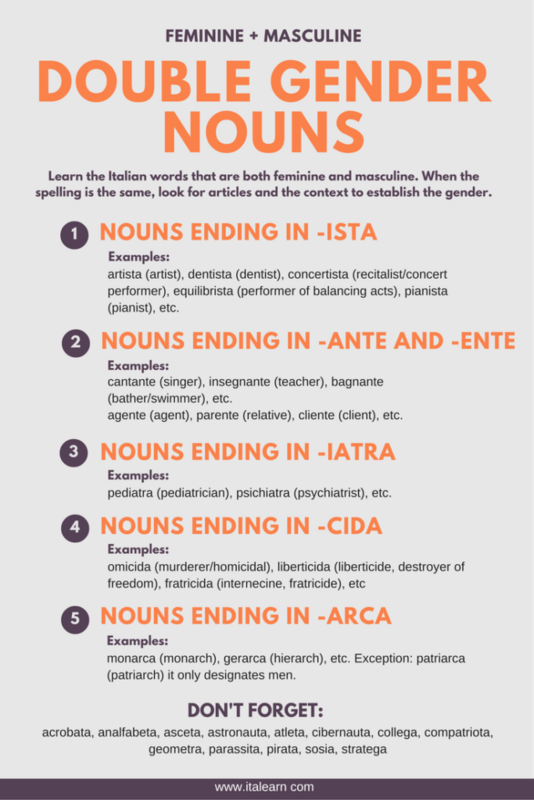 There are some words in Italian ending with -a or -e that are used to indicate both feminine and masculine subjects. The spelling is the same, so the context will tell us the right gender. Usually, there is an article there to help us. Many of these nouns (some can also be used as adjectives) are not too common, you may probably just read them in formal writing or medical literature, but it is still useful to know how to tell if a doctor is a woman or a man. Read until the end, where you find more words you may already know! 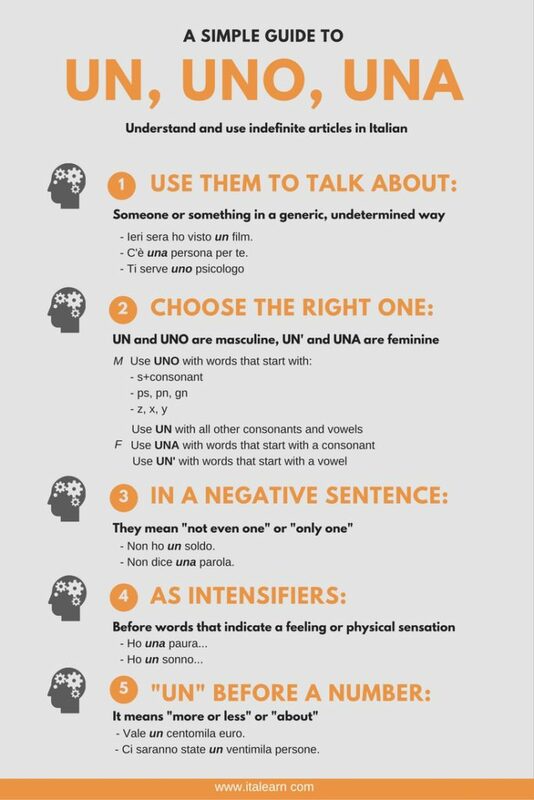 5 steps to understanding when and how to use indefinite articles in Italian. 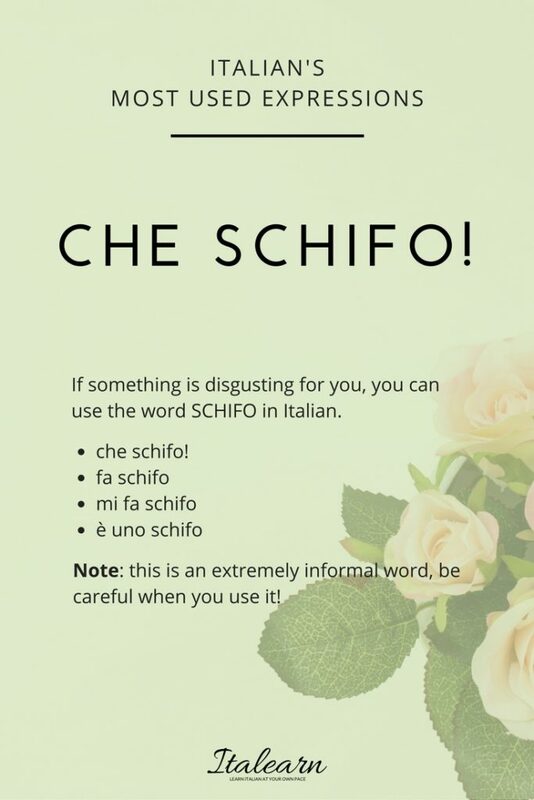 These little words are used a lot in Italian and it’s not difficult to get the hang on how they work. Just remember to choose the feminine or masculine form correctly and you’re almost done! 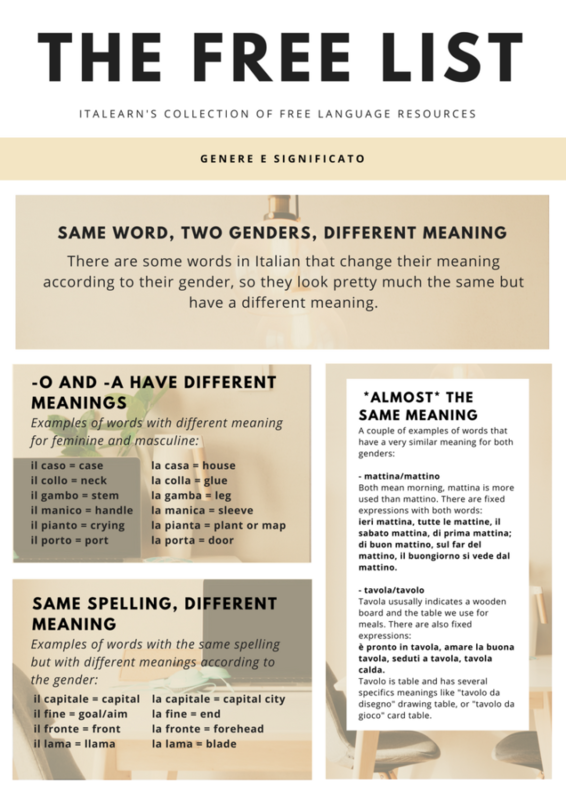 Did you know there are a few different meanings than the classic “one”? Check steps 3, 4, 5 to discover that. TO ACCENT OR NOT TO ACCENT? 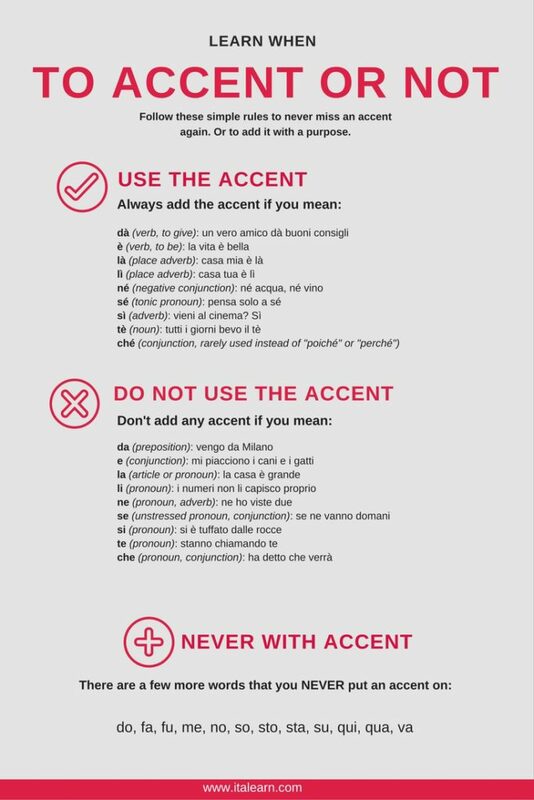 The accent issue is a tricky one, even for many native speakers of Italian. There is a handful of little words, one-syllable words, that do not have an accent because, well… they just don’t need it! But some of these words can have a double meaning (and grammatical function) so we have to tell exactly what is what in order to be understood. The solution is easy: we add an accent! 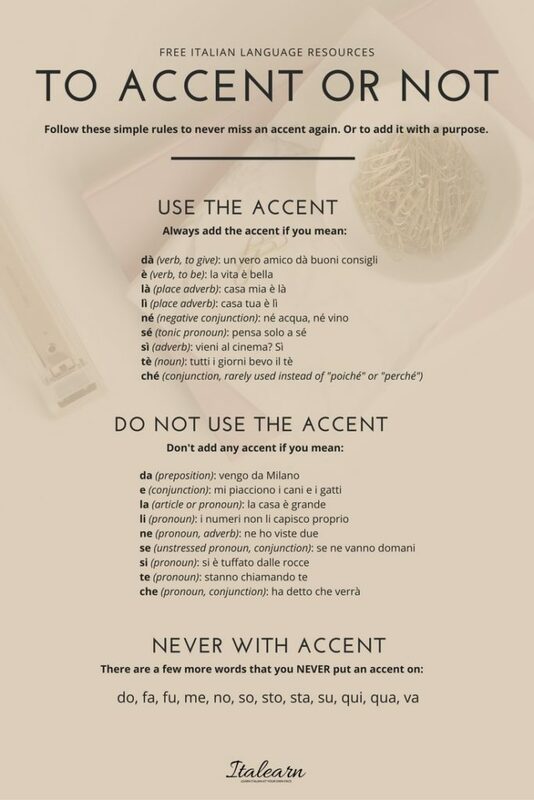 In this infographic you are going to find the list of all the one-syllable words that can have an accent and how to use them.